First you'll need to log onto My Profile using your email and password. 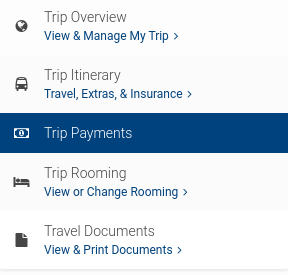 On the left-hand side of the page you will see the option to click on "Trip Payments" under My Trips. On this page you will see a price breakdown for your trip, as well as payment history, and upcoming payments dates. Click on the orange box that says "Make A Payment". All you need to do is enter the amount you wish to pay, select your payment method, and select or add the card you would like to use. To complete the payment, click the orange box on the bottom right side that says "Process Payment". You will be notified right away if your transaction was successful or not. We recommend adding a credit card to your file and choosing 'Autopay', this way your card will be charged automatically each month on the payment date and you do not have to worry about logging in to make payments. We will automatically send a receipt to the traveler's email address after each payment as well as to the parent/guardian if the traveler is under 18.